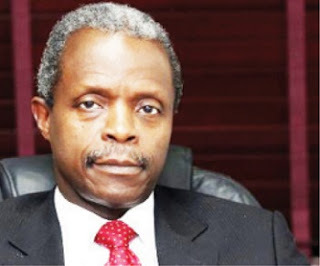 Home / GOVERNMENT/POLITICS / Opinion/Editorial / 2016 Budget: Where is Vice-President Yemi Osinbajo? 2016 Budget: Where is Vice-President Yemi Osinbajo? Most Nigerian youths show apathy towards politics and the word 'politician' signals 'lies and stealing' to the people. I used to be a staunch member of that class. I ignored critical issues to focus on music, romance, social networking and entertainment in general. I subscribed to the popular prayer of the masses that one day fate will bestow upon me a chance to serve and my pockets will be heavily enriched from the state treasury out of ignorance. As time went on, I started feeling the impact of bad governance with the menace of unemployment and surging poverty. My parents retired from the civil service and passed the economic baton to me. I was like a blind runner with a directional problem not to talk of speed. The threat of Boko Haram insurgency woke our consciousness from perpetual coma as youths alongside other biting national issues. Most youths out of frustration of long expectance of development took to social media to ask strategic questions about the governance of Nigeria. Memes trailed the reported disappearance of N20 billion dollars from the Excess crude oil Account. The All Progressives Congress, APC soared high on social media finding answers to the inquiries of hungry and angry Nigerian youths. When Buhari was presented as a Senior Secondary School Certificate holder with result later reported to be missing, we were too agitated to consider his low academic qualifications. I personally felt a synergy with his running-mate; Professor Yemi Osinbajo will cover up for his intellectual weaknesses. When Osinbajo who is the Pastor in charge of the Lagos Province 48, Olive Tree provincial headquarter parish, Ikoyi, Lagos was nominated as Buhari's running-mate, he swung into action delivering public speeches on the poor state of the nation with a stellar display of oratory skills. Nigerians who were eager for a change started making comparisons between Osinbajo and other Vice-Presidents in Nigeria thus far namely Atiku Abubakar and Namadi Sambo. Vice Presidents in Nigeria have this 'cultural' character of only occupying offices with virtually no responsibilities. In fact, they exist to fill in the gap for photographic reasons and attending to issues that are on the residual list of the president. Osinbajo made an instant impact touring social events in Lagos including the concert of Nigerian indigenous rapper, Olamide which gathered a lot of youths. Additionally, his high rank as a man of God in one of the largest religious ministries in Nigeria, Redeemed Christian Church of God boosted his acceptance as Nigerians and other church members believed he would never be compromised especially during a period the APC was widely regarded as an Islamic party with a covert plan to islamize Nigeria just like Turkey. The London School of Economics graduate who was one of the think-tanks that designed the manifesto of the ruling party during the electioneering campaign period lived to his status as a professor as he spoke with an admirable intellectual capacity making references to staggering statistics like poverty rate in Nigeria during which he said 110 million Nigerians live in abject poverty with the vast resources of the country shared by a few privileged people, Nigeria also loses an average of N3.1 Trillion to crude oil theft yearly and also his vivid analysis of Nigeria's debt profile which stands at $60 billion calling for an urgent attention. This came at a period when the only major statement former President Goodluck Jonathan's Vice President, Namadi Sambo could make during a campaign in the northern part of Nigeria was that the electorate shouldn't vote for 'those without certificates' referring to Buhari. He strayed away from an issue-based campaign to character assassination. After the victory of the All Progressives Congress at the central level, Osinbajo continued with the critical analysis of pertinent economic issues affecting the nation thereby sending a glimpse of hope to the Nigerian masses including me. I followed his public defense of the introduction of the Treasury Single Account, Zero-based budgeting system and also his breathtaking perspective on the delisting of Nigeria from the JP Morgan Emerging Government Market Bond Index considering his background as a Legal Practitioner and not an Economist professionally. It would be recalled that before Buhari inaugurated his cabinet, Osinbajo said at the National Economic Summit in Abuja that it is his duty to supervise the Nigerian economy and there will be no coordinating minister for the economy unlike the previous administration. Osinbajo also toured the war-torn north-eastern part of Nigeria where he pacified the millions of Internally Displaced People with messages of hope of an end to Boko Haram insurgency as he visited their various camps. What about his speech on the one-meal-a-day project for primary schools across Nigeria? According to him, this feeding project including the provision of employment opportunities will cost the government an investment of N980 billion. His estimate shows there is a structure on ground to operationalize the plan. Fast-forward to 22nd of December, 2015; the great Professor Yemi Osinbajo who has been seen as an element of hope and intellectualism, a Pastor standing for the truth, a Lawyer advocating for the interest of the masses, an Economist proffering a serum to the ailing Nigerian economy and finally an incorruptible figure of integrity successfully joined the league of politicians involved in the torment of the hapless masses. The 2016 national budget presented by Buhari to the National Assembly is an embodiment of my claims. Remember the country is plunging into a deeper debt profile after borrowing N1.84 trillion to execute the budget which amounts to borrowing N5 billion a day to finance an appropriation bill of N6.08 trillion according to the PDP's national party secretary, Olisa Metuh. The 2016 appropriation bill deemed the 'Budget of Change' has attracted massive furore and disclaimers notably from the Minister of Health, Isaac Adewole and Minister for Information and Culture, Lai Mohammed but because of time factor, I will like to focus on the budgetary allocations to the office of the Vice President, Yemi Osinbajo who is the major subject of focus in this piece. The library of Osinbajo will gulp a staggering sum of N4,906,22 on books alone which is more than the total allocations of 11 polytechnics out of the 22 federal polytechnics we have in Nigeria. In fact, of all government-owned educational institutions across all levels, only two got more allocations for books than what was proposed for the Vice President according to Premium Times. It would be recalled that last year, the library of the Vice President got a budgetary allocation in excess of N7 million which gives an impression that the office maybe venturing in the sale of books to make money for the government. Medical Centre, a separate line item under “State House HQTRS” lists a N203,273,602 budget for drugs plus medical supplies and the vice president was also allotted an additional N7.54 million for medical expenses. In comparison to the State House Medical Centre’s N3.8billion allocation, only N2,666,853,303 was proposed in the budget for the construction of hospitals nationwide. One would wonder why so much funds are committed to the State House Medical Centre when all the doctors of Buhari are not in Nigeria as he claimed while on his 5-day vacation in the United Kingdom. Some ministers have blamed the bloated figures in the budget on some 'rats'. This is not Lassa Fever for crying out loud. This action was perpetrated by human beings in high places. Anybody that believes the figures came by accident or out of typographical errors without the knowledge of all the ministers needs mental rehabilitation. The denial is only emanating out of public awareness; no secret activity can stand exposure particularly during a period where the economic hardship has instilled a sense of political consciousness in the masses. Osinbajo with his high level of intelligence and achievements should be held accountable for the hyper-inflated proposed funds allocated to his office without the exclusion of other ministers. It’s simply called accountability. For how long can we keep believing the alterations were perpetrated by 'rats' or a fictitious cabal like the veil that was used to cover the identities of the crude oil thieves till date? The appropriation bill is an aberration to the terms of the Zero-based budgeting system which requires that the budget request be re-evaluated thoroughly, starting from the zero-base; this involves preparation of a fresh budget every year without reference to the past. I am sure it was on this premise that the former governor of the Central Bank of Nigeria, Professor Charles Soludo claimed Buhari copied the budget of former President Goodluck Jonathan. The zero-based budgeting has now being misinterpreted my civil servants to mean the arbitrary act of adding multiple zeros to figures. I read Buhari has ordered the probe of civil servants responsible for the sham budget but its more appalling that the Minister of Budget and Planning Udo Udoma has feigned ignorance of the ongoing probe. As a sympathizer of the current administration, I have to admit my face is currently buried in shame and ashes following the valid criticisms trailing the so-called budget of change that is supposed to cut the wastage of government resources rather than aggravate the problem. In a sane polity, such a scandal should have attracted a rain of resignation letters from government officials but in Nigeria, anything goes as they say. I was moved to tears with a recent action of Marco Rubio, presidential candidate hopeful of the Republican Party in the United States of America. He performed badly in the New Hampshire primaries coming 5th probably due to his poor performance at a deciding debate that preceded the election. After the results were announced; He apologized to his supporters, taking the full blames for the unexpected results at the polls with a strong promise never to let them down again. That is leadership. Nobody expects any administration to be perfect but transparency should be paramount. It gives the followers a sense of belonging and trust. Up till date, even the VP is yet to tender an apology to Nigerians for abusing public trust with the unjustifiable allocations. Let's assume Buhari isn't vast in figures and his entire cabinet decided to let him down with the provisions of the budget, is his Vice, Osinbajo who is a pastor with them too? Or the zero-budgeting system based on the principle of necessity was compiled without his consent or endorsement? This is the first time I will agree with the controversial governor of Ekiti state, Ayodele Fayose that the 2016 national budget is a national disgrace that should be withdrawn promptly. I write this article out of personal respect and high hopes in the Vice President who I am full of admiration of since his emergence in the political sphere.